Record sea surface temperatures in the coral sea are again threatening massive coral bleaching on the Great Barrier Reef for the second year in a row. If sea surface temperatures don't cool in the next few weeks, this will be the first time there has been back to back bleaching on this scale. “In the last week, divers and scientists have reported bleached corals on popular tourist reefs around Cairns and on reefs near Townsville.” said Imogen Zethoven Australian Marine Conservation Society Great Barrier Reef Campaign Director. 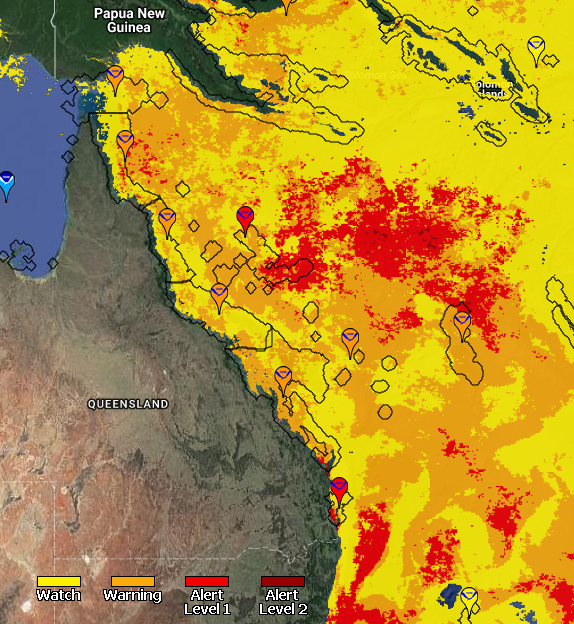 Vast swathes of the Great Barrier Reef have also been placed on red alert (Alert Level 1) for the next four weeks, as an indicator that coral bleaching is likely. Parts of the Far Northern, Northern and Central Reef are on the even higher Alert Level 2, indicating mortality is likely. Corals south of Cairns, in the Whitsundays and in parts of the Far Northern Reef, that were badly hit last year, are at mortal risk. The US National Oceanic and Atmospheric Administration’s Coral Reef Watch program shows details of sea surface temperatures and warning alerts (See above screen shot 25 Feb 2017. "The unprecedented severe bleaching and mortality of corals in 2016 in the Great Barrier Reef is a game changer. Given the severity of the damage and the slow trajectory of recovery, the overarching vision of the 2050 Plan, to ensure the Great Barrier Reef continues to improve on its Outstanding Universal Value every decade between now and 2050, is no longer attainable for at least the next two decades." the report warns. "The bleaching also highlights the urgency of bolstering the resilience of the GBR World Heritage Area to maximize its capacity to recover before the next bleaching inevitably occurs. The Reef 2050 Plan is a key element of building resilience, but improving water quality can never climate-proof the Reef." Coral reef systems can take 8 to 10 years to recover from a bleaching event. The report make it clear that elevated sea surface temperatures that caused the coral bleaching in 2016 was driven by climate change. While addressing climate change is a shared global responsibility, Australia has a special role to address the issues of climate change and reef protection. "Australia’s current national emission reduction targets are not commensurate with a fair contribution to the reduced global carbon budget required to meet the Paris Agreement targets and protect the GBR World Heritage Area and coral reefs worldwide. As the guardian of the world’s largest coral reef World Heritage Area, Australia has an opportunity to play an important leadership role on climate change and to do its fair share of emission reductions, consistent with meeting the 1.5C target. Australia must do more and do it urgently." While the report is critical in many areas it also says that good work is underway, but it needs to be scaled-up and adequately financed. The Great Barrier Reef Marine Park Authority is reporting in mid February daily sea surface temperature anomalies ranging from 0.9–2C higher than long-term monthly averages within the Great Barrier Reef Marine Park. "We’re receiving increasing reports of variable levels of bleaching across the Marine Park and we’re closely monitoring the situation." “The solutions are clear: we must ensure no new coal mines and we must urgently cut carbon pollution." While the review report does not specifically mention the Adani coal mine proposed development, it is clear that such a mine if it went ahead would contribute to the greenhouse gases in the atmosphere, as well as increasing shipping traffic through sensitive reef waters. “The worst thing governments could be doing to our Reef and the 70,000 people who depend on it for their livelihoods is to allow the Adani Carmichael mine to proceed. The coal mine would super charge climate change and tip the world over the edge of 1.5°C, spelling catastrophe for our Great Barrier Reef and all the world’s coral reefs,” said Zethoven. She highlighted that sea surface temperatures over the next two weeks will be critical. “If the hot weather and clear skies continue, then we will see a second severe mass bleaching event. This would be the first time that our Reef would have bleached two years in a row."